Ochil HillsWalk , Ben Cleuch Walk, Tillicoultry, Gannel Burn, Mill Glen. Dominating the Clackmannanshire communities of Alloa, Alva and Tillicoultry, the Ochil Hills have long been a popular stomping ground for walkers. Ben Cleuch, at 2363 feet, is the highest of the many tops scattered over the tapestry of rolling summits, deep rocky gorges and crystal clear reservoirs. Its steep sides make for a spirited ascent with views from the top ample reward for the sweat-inducing effort. Opposite the car park entrance, a wide path bears left through deciduous woodland, the forest floor carpeted with bracken and bluebells. As the legs become accustomed to the outdoors once again, the track forks. Take the right hand option and climb up through the trees until it curves sharply right. Leave it here and carry straight on ahead along a path over a burn cascading down a narrow wooded gorge. Below to the left, old mine workings lurk in the undergrowth. The way emerges on to the open hillside at a kissing gate where it joins a twisting track rising up the glen. The climb is initially strenuous but it eases off as the way straightens out to run north towards Ben Ever. The route goes through a gate and a short way on arrives at a second gate where a wide grassy path leaves the main track and climbs over the open hillside. 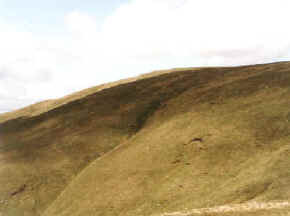 Rise through tussocky grass, passing a small sheep enclosure on the left, and continue to climb to a small pool of water on the ridge. Carry on up the path to the top of Ben Ever which is just a short way off, with Ben Cleuch in view ahead. The path descends to a wooden gate at the junction of three fences. Cross where the remains of a stile are to be found and climb to the right of the fence to reach the trig point on the top. Ben Cleuch offers superb views over the surrounding countryside, the urban sprawl of industry clustered around the River Forth to the south contrasting with the open moorland to the north and east. Follow the path east from the summit and descend over The Law, a low summit on the ridge above Tillicoultry. Beyond it, the path drops steeply to cross a footbridge over the Gannel Burn at the top of Mill Glen. Once across the bubbling burn, take the path left round the east side of the gorge. It skirts the hillside before descending to open ground to reach a small gate, beyond which a path leads to a car park at the back of Tillicoultry. Follow the road for a short way down to the left of the burn and turn right over a footbridge spanning the water. Continue along Scotland Place to reach a footpath at the end. This crosses a driveway and disappears into bushes to emerge on to a narrow tarmac road. A few yards to the right a green sign marks the start of a public footpath back to Alva. It runs alongside Tillicoultry's golf course, into woodland and then emerges on to a roadway that runs by the Farriers Hotel, beyond which you are back at the car park. Map OS Landranger 1:50,000 sheet 58. Start Woodlands Park car park, Alva (grid ref NS 898975). Parking The car park is reached from the main A91, with the turn-off on the north side of the road on the eastern edge of Alva, signed for Farriers Hotel and craft shop. Grading A strenuous hike to the summit of the highest peak in the Ochils. Sheep grazing means dogs should be on the lead.